First Law of Bicycling: No matter which way you ride it's uphill and against the wind. Not just one or two, but FIVE vehicles parked in the bike lane! This street (N Northlake Place) is one-way East/South, with a contraflow (North/West) bike lane. 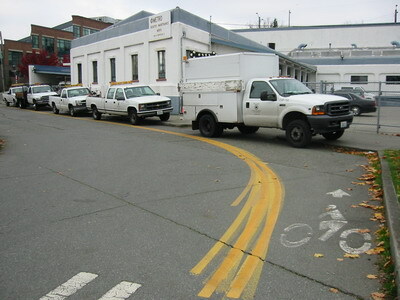 King County maintenance vehicles habitually park in the bike lane. This forces bicyclist to ride against traffic on the wrong side of the double-yellow line. Does this look familiar? 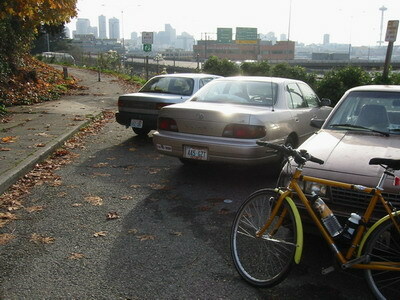 Illegally parked cars block access to the "Melrose Connector" bike path at Lakeview and Belmont, in Seattle. The sign is clear, yet drivers habitually break the law and park here. I've contacted the Seattle Police Department and Parking Enforcement to try and get more patrols. I've also written to the Seattle Department of Transportation. Nothing seems to work. Here's a short video illustrating the problem at the intersection of Florentia and Nickerson near the Fremont Bridge in Seattle. Eastbound traffic on Florentia are not allowed to turn right on Red and get only a very short green light, but crossing vehicles on Nickerson frequently run their red light and block up the intersection so when Florentia does get the green, they are unable to turn. This is a prime candidate for Red Light Camera!